Planning a jaunt to Havana, Florida? Enjoy ethnic cookery? Why not schedule your visit to the historic district of this quaint and charming community on one of the days that cooking classes are being held at Canopy Rose Culinary Arts Studio and Catering Company? 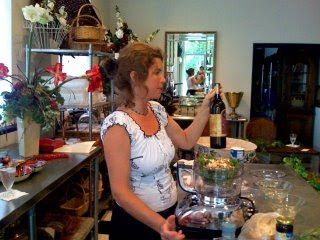 A new calendar of cooking classes is in the works and will be posted as new class offerings become available. Want to be in the know about all our different classes? Come learn how to cook Greek at an exciting new Sunday afternoon cooking class. Beginning on Sunday, July 27, 2008 the Canopy Rose Culinary Arts Studio and Catering Company in downtown Havana, Florida will be the setting for the first class in a series of Sunday afternoon Greek cooking classes. Classes will run from around 3 pm to 5 pm. Reservations must be made and paid for at least 4 days prior to the class. Space is limited. Book early! Full details and class schedule will be posted this Monday! Canopy Rose has long been a leader in promoting several Lean "N Green practices in it's catering. 1. The use of a large percentage of colorful fresh fruits and veggies. 2. The use of as many locally grown or raised food products as possible. 3. The frequent use of certified organic products. 4. The use of fresh food over pre-processed food. Our Lean 'N Green practices are another reason why the foods of Canopy Rose are always so delicious. 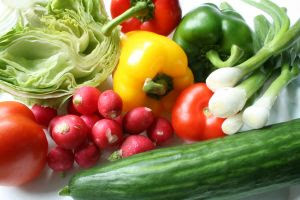 You just can not go wrong when you work with the freshest and the most nutritious garden fresh produce. In addition to preparing eco-licious foods, we continue to embrace "Going Green" in other ways that will help to reduce our carbon footprint. "Kiss, Kiss. Bang, bang. Hallalujah!" said the keynote speaker. A tidal wave of laughter rolled across the room as the New York Times best-selling author captivated the crowd. During the closing ceremony, the owner of Canopy Rose Culinary Arts Studio and Catering Company won an award for her food and entertaining writing. Kathi Dameron- the Tallahassee-area caterer, event designer and teacher of cooking classes, who writes the food and entertaining column in the Northeast Chronicle (a community publication of the Tallahassee Democrat) won second place in the Newspaper Article category. The winning article, "Simple Act of Sharing Food Can Truly Bring People Together" originally appeared in print during the spring of 2008. For your next event, why not hire an award winner? Kathi Dameron has been winning awards for her creativity her entire life. Grand Prize, First Prize, Second Prize, Honorable Mention and Booby Prizes... one thing you can be sure of is that when Kathi Dameron takes on a project she will put her heart and soul into making it prize-worthy! Request a catering bid for your upcoming Tallahassee, North Florida or South Georgia function. We will do our best to provide a bid for you within 24 hours. Please feel free to include as much detail and information as you desire. Please send your request for a catering bid to Kathi Dameron at canopyrose@aol.com, please make sure to include phone numbers where we can reach you. Check it out! Go Team!! One of the most unique holiday party venues in the North Florida capital region area is located in the historic, old tobacco town of Havana, just a short jaunt away from Tallahassee. The Canopy Rose Culinary Arts Studio and Catering Company offers a one-stop shop for your company Christmas party. We provide an elegant candlelit setting, with tall bistro tables and loveseats for your pre-dinner cocktail hour, elegantly appointed dining tables and seating for your choice of a butler-served or buffet dinner and a surprise dessert extravaganza that your guests will be talking about for years to come! Our menus are custom-designed and presented with wonderful style and pizzazz by none other than Tallahassee's own food writer and newspaper columnist, Kathi Dameron, who writes the popular and fun, Entertaining with Kathi column in the Northeast Chronicle. For information on availability please call Kathi on her direct line at 850-539-7750. If you happen to get the voice mail... do leave a message, since we are often either on another telephone call or in the kitchen busy whipping up some edible masterpiece. The 2008 Christmas holiday season might still be several months away, but it is not too early to lock in your caterer, venue, entertainment and party rental supplies now if you have not already done so. By this time of year, many sites are already booked up. Such was the case with Dorothy B. Oven Park, one of Tallahassee's premiere wedding, special event and meeting sites. "We are booked solid the entire month of December," Mary Lou from Oven Park said when I called to inquire this morning about a couple dates in December. Don't get discouraged... there are always plenty of delightful options for unforgettable parties. Actually some of the nicest parties that we have catered over the years were held in private homes. Are you willing to open your home up to your co-workers for your annual party? It's a beautiful thing to do and there is something about a private party in the intimacy of one's home that far surpasses the rather sterile environment of a meeting room with a hourly meter ticking away. With the professional assistance of a catering and special event company, such as Canopy Rose, even the hosts will have a splendid time at a party given in their own home. And without having to pay the hefty space rental fees and damage deposits that can run upwards of $1250.00 ... perhaps the hosts can be provided with the gift of a couple of professional housecleanings, one before and another one following the party, some pre-party lawn maintenance and gorgeous floral arrangements. The cost of all of this is almost minimalistic when compared with the cost of room rentals during the busy holiday months. In the unlikely event that no one in the firm wishes to swing open their doors in hospitality, there are still plenty of creative options available! Just call Kathi Dameron at 850-539-7750. Canopy Rose is a delicious and diverse operation run by Kathi Dameron who wears the hats of food writer, caterer, special event designer, publicist, food stylist, cooking teacher, hospitality trainer and culinary collaborator. The Common Denominator with everything we do at Canopy Rose is FOOD... FABULOUS FOOD! Some clients (such as corporate office administrators, party planners and brides) need catering menus and prepared foods for their upcoming shindigs. Some clients need unique PR strategies for generating excitement about their business. They welcome our creativity in helping to beef up their bottom lines through food, fun and festivity. Some clients (such as restaurants) need help writing menus, commercials and ad copy. Some clients (such as restaurants and catering companies) need help training their staff in creating beautiful food that sings with flavor and in raising the bar on how to offer impeccable customer service. Some clients (such as regional chefs) need someone to write a magazine article, brochure or cookbook for them. Some clients (such as ad agencies) need the art of a food stylist to make a client’s product look as delicious as possible for compelling photography. Some clients want to learn how to cook like a caterer! Some clients (such as magazines, newspapers and websites) want fresh and innovative content for their publications to attract readers and advertisers. We do all this and more! For more information contact Kathi Dameron at 850-539-7750.